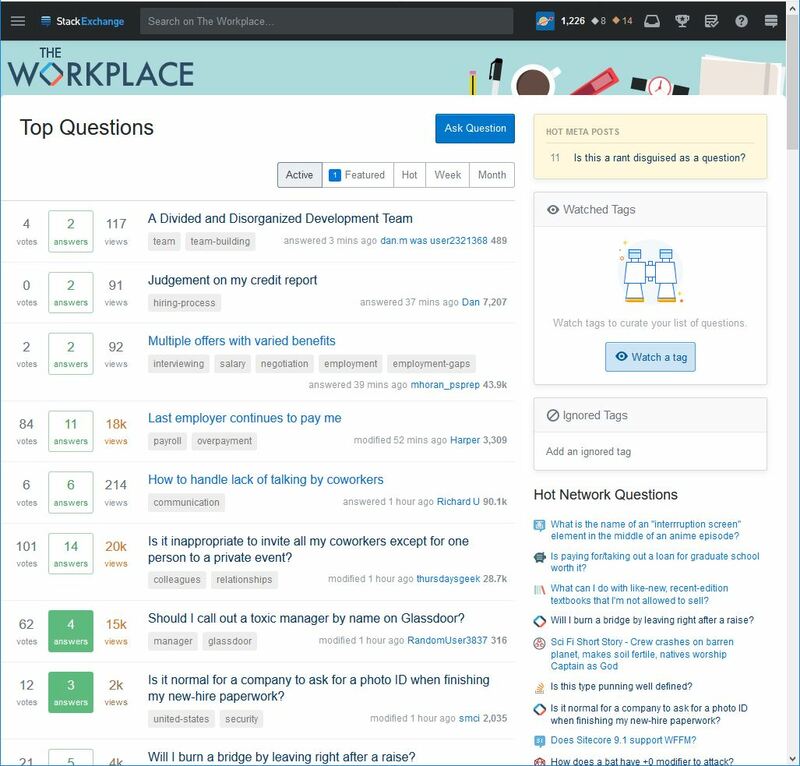 I'm sorry if I'm asking a silly question and the answer should be obvious but when I visit Workplace, no matter which tab is selected, I mostly see questions with several answers already in place. Every once in a while I see questions with no answers but only rarely. SE used to have a listing for new questions (that were just recently asked) but I don't think I see those anymore (the tabs all just show questions with high activity, regardless of age). Am I doing something wrong? Or are newly asked questions simply at the end of the active queue? Since the update on responsive design and left navigation sidebar, the navigation bar is moved from the header of the site to the left sidebar. If the user is enabling hide left navigation (based on the screenshot), the left navigation will be collapsed into the hamburger menu on the top-left (beside Stack Exchange logo). You can access the "all questions" list from there, or accessing this direct link for the newest questions. Are all the questions gone? How can we migrate questions to other SE sites? How come there are 5 Workplace questions in the hot list? “This is a new users answer to an old question” but answer is dated January 2013?